The Easter bunny comes around every Spring with surprises sweets, treats and delights – but all baskets and eggs don’t have to be filled with chocolate. Save your kids from the inevitable sugar rush post morning egg-hunt, by incorporating healthy snacks. Show off your creativity and get festive by substituting the sweets for these healthy goodies, and non-candy options! 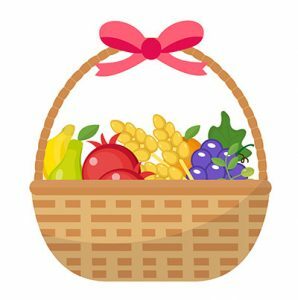 Stay Away from Pre-Made Baskets – Have those elaborate plastic baskets shown up at your local supermarket? They’re usually filled with sugar-filled candy, chocolate, a few toys, and lots of tissue paper. Plus, they’re overpriced. Save money by grabbing a basket from a local dollar store and filling it with healthy options you know your child will enjoy. Healthy Portion Snacks – Those plastic eggs are a great way to monitor portion control, so why not use snacks you know are healthy? Use snack-size plastic sandwich bags and fill with cereal, granola, raisins, crackers, or cherry tomatoes. Hard-Boiled Eggs – Before you dip them in dye, set some of these healthy snacks aside! Hard-boiled eggs add good fats to your body, keep your heart healthy, and they also pack important vitamins to help protect your eyes and keep your bones strong. Trail Mix – Throw together some pretzel sticks, yogurt covered raisins, nuts, craisins, and Boom! You’ve got bunny bait. Non-Candy Treats – Get active with a brand new jump rope! Also, nail polish, hair clips, glow sticks, stick-on tattoos, magnetic letters, toy cars, bubbles, bouncy balls, playdoh, sidewalk chalk, colorful band-aids, etc. Garden Seeds – What better way to spring into the season than to start a vegetable garden. Learning young will give your kids the ability to grow their own healthy foods as adults. Fun-Themed Snacks – Make DIY bunny ears and draw a funny face on the plastic wrapper of string cheese. 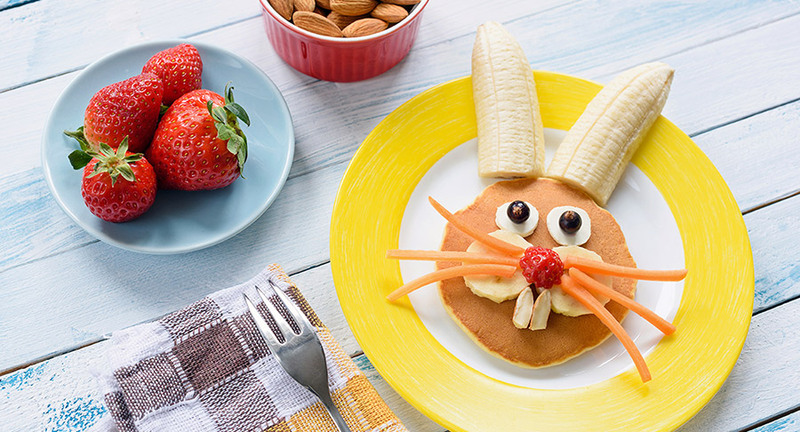 Create “Bunny” looking pancakes with different shapes. Try a carrot and hummus dip or even use Easter cookie-cutters on watermelon, cantaloupe or pineapple to create Easter shaped healthy snacks. Dark Chocolate – If you must indulge, the darker the chocolate the better! Look for an organic dark chocolate that contains more than 70% cacao to benefit from all the major antioxidants this semi-sweet option has in store.